The Spud Shack Fry Company – Located in New Westminster in the mall attached to the New Westminster Skytrain Station is this small, trendy little counter service restaurant that specializes in fries, poutine, burgers, sandwiches and a decent selection of Craft Beer bottles (go to www.spudshack.ca for their menu and other information). They also do catering, host events and put on Effin’ Good Comedy events on the last Monday of every month (please see Mike’s Craft Beer Review of the Event for more details). In regards to catering, the thought of throwing a Plethora of Poutine Party at some point really floats my boat so I think I will have to investigate this avenue further. And yes, I love alliteration sometimes a little too much but who wouldn’t love to go to a Plethora of Poutine Party? The Craft Beer – I didn’t take a picture, but you can expect to see a couple of local draught beer taps a good 12 or more bottles that range from local beers like Four Winds to great imports like Saison Dupoint or New Belgium. Be careful, if you are beer geek like me they will likely offer you a frozen glass for your beer however if you ask non-frozen glass they will kindly oblige. Prices are comparable for the area and the selection is good enough to satisfy the geekiest of craft beer fans for a small counter service restaurant. 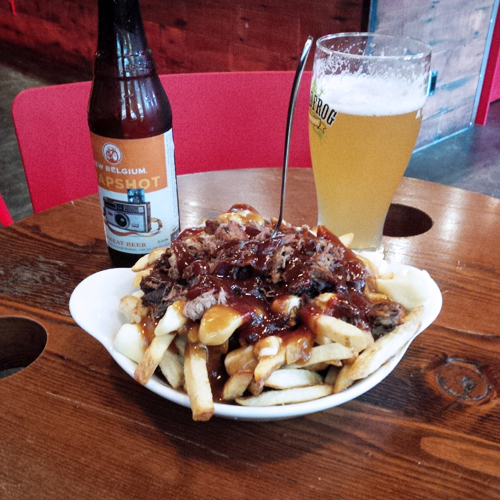 I enjoyed a New Belgium Snapshot wheat beer, which has a unique tartness on the finish that paired really well the tangy BBQ sauce on my poutine. The Fries & Poutine – Overall the fries alone are very good (they call them ‘frites’ for flare I guess?) being both tasty and well executed but there’s nothing overly special about them beyond that. As far as plain fries go, try Moby Dicks on White Rock beach who uses Yukon Gold Potatoes if you want to be blown away how good a basic french fry can be, or 5 Guys Burgers & Fries who uses peanut oil for their fries and overloads your to go bag. That being said, making them into poutine by smothering them in gravy, BBQ sauce, cheese curds and pulled pork and it’s almost a dream come true. The pulled pork was the real highlight here, that stuff was fantastic and some of the best I have ever had as it was perfectly smoked and seasoned. The pictured portion is a medium, so they give you real value for you money there and the service was quick. If you go here, be sure to try the poutine they have lots of varieties and you would be hard pressed to find much better in the area. Overall Impression – Excellent, I am more then happy to return here and while writing this review and staring at the picture above has made me ridiculously hungry for more! I want to try all of their poutine varieties so I’ll be back for sure and their desserts look pretty interesting too. They also have fish & chips which might be worth a try as it’s hard to find really good fish & chips beyond White Rock Beach. Value for Money – Very good, they don’t mess around with portions here so you get what you pay for and more. The order of poutine was $10.75 and I felt that the portion was right for the price. Be sure to skip the crap fast food joints and check this place out instead! Please share your experience in the comments section here, what did you think of them? Trip #2 Update: Two more poutine dishes and dessert! I went back with my wife the other day and we split the two small poutine servings as seen below. The smoked meat was salty, smokey and enhanced the poutine quite nicely working with the fries, cheese and gravy instead of against it. The bacon on the sour cream poutine was plentiful, real and full of salty oily goodness that only bacon can provide. I would easily recommend either on or both of these, honestly can’t really pick a favourite quite yet. A small is pretty decent size and great value at this place, I have yet to order a large there. No beer was paired with this meal as I was saving that for later plus I wanted to have room for this Banana Bread Ice Cream Sandwich, which was a nice subtle banana flavour mixed in with the cool chocolate ice cream that went down nice on a hot day. I dipped the sandwich in the compote, but it was cherry and I don’t particularly love cherries so I skipped it after trying once. Also worth noting, they had to preheat the grill for this one when I was there before the rush, order with your food if you are in a hurry. The chocolate chalice is next on my list of things to try! No that isn’t ketchup, it’s cherry pie compote. My family and I were out in New Westminster to pick up our last CSA produce delivery and we wanted to get some pizza and gelato from the place in the New West Quay, however unfortunately they had moved to their winter hours and were closed. Well, when life gives you lemons you toss them and go get Poutine so that’s what we did. I had been wanting to try the Night Market and Buffalo Chicken poutine anyway, so we ordered 4 small servings (also repeating the Bacon Sour Cream and Pulled Pork) and split them between us. Both of these were quite tasty, however the Night Market (featuring Ginger Beef, Kimchi, Spicy Mayo and crispy Wontons) was a huge hit and I am glad to see it on the menu this kind of fusion success makes me very happy! The Buffalo Chicken poutine was spicy and a touch overpowering, but if you want something hot and cheesy this is a good one. Seriously though, if you want something wonderfully different go with the Night Market Poutine. Buffalo Chicken Poutine (left) and Night Market Poutine (right). I love the food, beer selection and everyone that works at the Spud Shack. It is a great little place with great food. The comedy night is awesome also. Thanks for the plug! Definitely a little gem in that new mall there. Thanks for the Spud love, Mike. You rock.